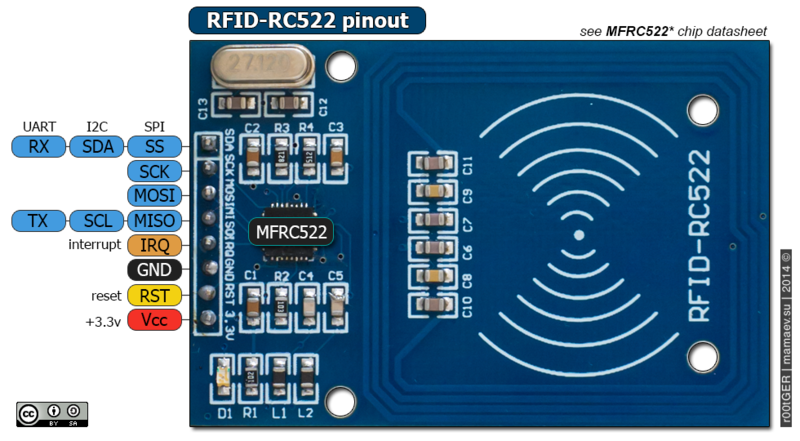 Please post a link to the datasheet for your rc522. My guess is your not talking to it correctly! SPI is a full duplex comm, so it reads/writes at the same time. When you send a command to the device, it needs to process that command, so you wait, then you send something to it so it can respond back. Your program only sends once, waits, and some how expects the data to magically appear in the SPDR register without sending anything to the RC522. Read the data sheet and see what you need to do to receive data from the device. There must be a gazillion arduino projects using the RC522 you can look at to see how it works. Why in the world would you start out doing it that way?!? Why do you think there is a slave-select on SPI devices? If you always keep it enabled, then if you ever get out of sync you will never re-sync. Consider a false SCK pulse at startup, for example. You enable an SPI interrupt, but have no ISR. Not a good thing. Have you tested your USART connection with a startup message? Do you have the chip configured for SPI? i.e. pin 12c low, pin EA high, what M32 pin are you using for SS (NSS)? Can you show us your schematic on how you have it wired? An Arduino UNO is great to have on hand to test new devices, as you can find a demo sketch for most devices, and makes testing your h/w easy and verify it's operation. And USART works well, i tested it..
That is a very interesting UBRR value. I cannot remember seeing that before. 9600bps at 12MHz AVR clock? Whats the interesting on that UBBR value? Is works well..